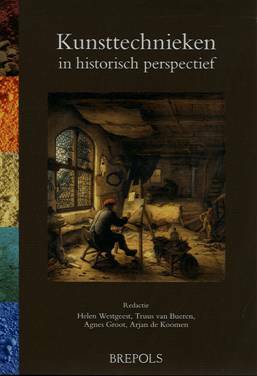 We are proud to announce the publication of Kunsttechnieken in Historisch Perspectief, a joint project by Helen Westgeest (Universiteit Leiden), Truus van Bueren (Universiteit Utrecht), Agnes Groot (VU University Amsterdam) and Arjan de Koomen (Universiteit van Amsterdam). Artworks are, in the first place, objects made by human hands. To understand the history of art, we should therefore also know the history of materials, their use and their production processes. Kunsttechnieken in Historisch Perspectief wishes to offer factual knowledge about commonly used materials and processes, as well as to answer the question why certain techniques became popular in the first place, only to be replaced by others. The book also incites its readers to consider the implications of such techniques on other aspects of art history. Kunsttechnieken in Historisch Perspectief includes 20 chapters that concern art techniques from ancient to modern and contemporary art, touching upon painting, sculpture, drawing, graphic techniques, photography, video, digital art and installation art. It also discusses issues of technical research, conservation and restoration.